Looking for a non - flavored cigarillo from Swisher Sweets? Tryout the new Swisher Sweets Diamonds Cigarillos. This unsweet variety provides a smooth and rich taste while enjoying a pure tobacco pleasure covered with a natural wrapper. 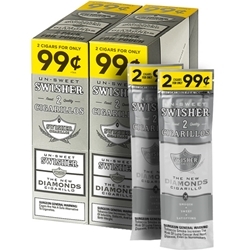 These new Swisher Sweets Diamonds Cigarillos promise a rich taste and heady aroma with a smooth draw and slow burn. Try them today at Smokers Discounts!